If you live in an apartment, the chances are high that you don’t have the real estate available to construct a massive home theater — the type of personal cinema room that puts your local multiplex to shame. 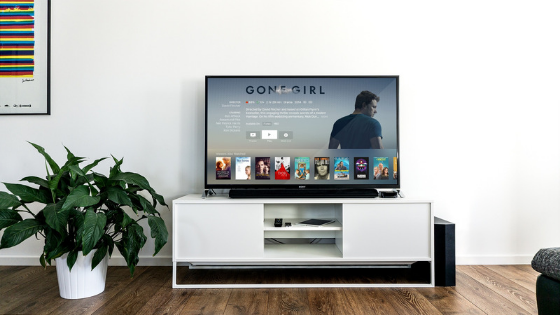 However, as flat-screen TVs are getting more affordable and more advanced than ever, you’ve definitely got the room for the shiny new big screen you’ve always wanted. When you go shopping, a lot of people might tell you that you can stick to good, old-fashioned 1080p because “you’d never be able to see the benefit of something like 4K in an apartment anyway.” The reality of the situation, however, is that this is something of a myth. You’re actually better equipped to handle a 4K TV in an apartment than anyone for reasons that are worth exploring. The reason for this comes down to something called viewing distance — the maximum distance you can sit away from your TV before the eye starts to lose some of that resolution on display. Viewing distance is always about 1.5 times the diagonal size of the television in question. So, if you buy a 60-inch 4K television set, your ideal viewing distance would be about 7.5 feet. This means that if you were to buy the same 60-inch 4K TV and put it in a larger room where you’re seated farther away, it would still look great — but the eye would lose that additional resolution and image clarity for every foot beyond 7.5 that you sit. In an apartment, you’re far more likely to sit closer to the screen than you would in a home — meaning that in this particular environment, you’re getting every last ounce of stunning 4K clarity that you’re paying for. So is it worth upgrading to a 4K TV if you live in an apartment? The answer is, overwhelmingly, “yes.” Now, go out and buy some UHD discs to play on it. If you’d like to find out more information about whether or not you really need a 4K television set if you live in an apartment, or if you’re just eager to discover some of the incredible apartments in Mountlake Terrace that are available, please don’t delay — contact Taluswood Apartments today.